The Steam Train from Blennerville to Ballyard, Tralee, and the Estuary Bird Sanctuary. The train leaving Ballyard Station, with Tralee Aquadome in the background. The Tralee and Dingle Light Railways locomotive No.5 shuffles out of Ballyard station at 11 o'clock, whistling and billowing smoke and steam. Bound for Blennerville, 3 kilometres away, it chuffs its way along the Tralee Bay estuary, past grazing cattle, scattering flocks of birds into the air every time it whistles. The engine, which first made its journey more than 100 years ago, had lain for years in Steam Town, Vermont. It has been restored to its former glory and the carriages painted a smart mauve with gold trim, with the logo of the Tralee & Dingle Steam Railway painted on the sides. In previous times, the train ran past Blennerville and headed west to Dingle, winding through the hills of West Kerry, the line fell into disuse in the 1950's, but in recent years the Tralee to Blennerville section has been restored. Steam railways continue to fascinate and enthral, but the Tralee and Dingle line is special. It's Europe's most westerly line and, as part of the famous Tralee and Dingle Light Railway (1891-1953), has folklore and tradition stretching back over 100 years. The railway is featured in the BBC Great Railway Journeys of the World TV series, as one of the world's most famous narrow-guage lines. 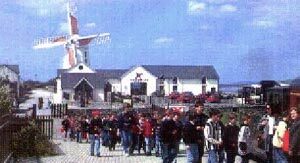 An enjoyable and historically interesting day out is assured for the discerning visitors who board the train for Blennerville in the morning, visits the Windmill complex and the Jeannie Johnston shipyard, and who, after fortifying themselves in the restaurant or one of the 2 local pubs, returns in the evening to Tralee. The Station Master shouts "All Aboard" at Blennerville Station for the return journey to Tralee. Along the shores of the Tralee Bay estuary, to which the Steam Railway runs parallel, is a renowned bird sanctuary. It has acquired a great reputation amongst birdwatchers because of the vast numbers of birds that fly in from all over Northern Europe to spend the winter here. The salt marsh which lies between Tralee and Blennerville holds a dazzling array of birds from September/October right through the winter until mid-March. While all of Tralee Bay holds birdlife of great interest at that time of year, the inner section of the River Lee Estuary from the very edge of Tralee as far as Annagh Island, beyond Blennerville, frequently holds the densest bird population abd attracts the greatest number of birdwatchers, both Irish and foreign, who have found it well worth spending some time in the area. Almost every morning I am able to see a solitary heron or cormorant, guillemot or two, a family of swans, complete with cygnets in the spring, and many flocks of small wading seabirds, and of course omnipresent seagulls scavenging. This is on my way into Tralee from my home near Blennerville. I think the great attraction of this area for birdwatchers is that they can get so near to the birds, and take pictures so easily. As you can see from the picture on the next page, the road runs between the estuary and the canal, but the birds are not at all startled by traffic, having become used to the noise. They don't stop feeding when even the noisiest lorry goes by. Every year more swans make the area their home. In previous years one or two pairs have returned every year to raise their cygnets, but this year I have counted at least a dozen adult swans. There is another attraction for ornithologists in the Tralee Bay area - the Freshwater Experience, on the Dingle Peninsula. It is a new venture comprising a Celtic historical theme park, wildfowl sanctuary and trout farm where you can fish for your own supper!